Apple has received samples on the 7.85-inch screens iPad according to Taiwan’s United Daily News, and claims that the “iPad mini” carries the same 1024 x 768 resolution similar to the original iPad. According to the reports from Unwired View, AU Optronics and LG Display have sent samples of the iPad Mini” display to Apple. Reports have it that the target launch for the iPad mini” will be early next year. However, it is unclear how Apple and its team will handle this 7.85-inch display screen, which smaller than the current iPad, considering that the iPad mini will also carry 1024 x 768 resolution. If that is the case, it means they must maintain the current resolution while the iPad apps would display on the iPad mini natively. The interface of the elements will be similar to the current iPad but smaller, a reduction from the original design that can somehow create usability issues. Steve Jobs had also criticized the 7-inch tablets on the market by competitors on his previous statements, and had said that they are too small, and roughly the 10-inch display is the ideal minimum screen size for a useful tablet. It was reported that Apple is preparing for its new iPad 3, which was recently reported that the iPad units go to production. Reports says iPad 3 will be launched early next year. 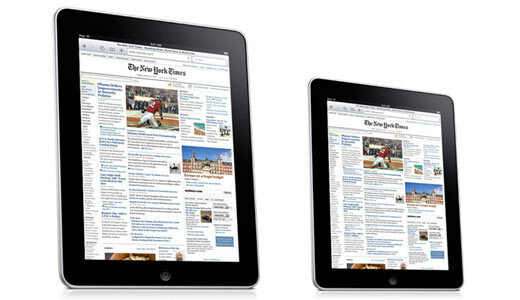 The new iPad 3 is said to have retina display with 2048 x 1536 resolution. A smaller iPad carrying a lower resolution of current iPad gives Apple the chance to lower-entry price points on its tablet products if it sees Amazon as a big threat.